Those who are able to enjoy their decks in the nice weather couldn’t imagine their home without it. For this reason alone, many consider having a deck installed when spring and the nice weather rolls around. There are many reasons why you should consider spring deck installation. A few of the most common reasons are below. Of course, this is the main benefit. Many people enjoy taking advantage of the nice weather, and a deck gives you a comfortable place to do just that. It also gives you a prime, unobstructed view of your yard where your pets or children may be playing. A deck is an extension of your home, and as such adds more room for entertaining. Especially on nice days, family and friends love to socialize on the deck. And sure, you can have your grill and outdoor furniture in the yard, but if the soil is wet or the landscape is uneven, it can be trouble. A deck is the best place for outdoor entertaining. Adding a deck to your home is one of the best ways to increase your home’s value. Anyone can make good use of a quality deck, so having a contractor install this valuable addition to your home will certainly increase its value. But the increase in value isn’t just seen on the market—you’ll see more value in your home as well with an attractive new addition to be excited about. Spring is the best time for deck installation. The weather is getting nicer, and you’ll have your new deck just in time for summer parties and lazy deck lounging. 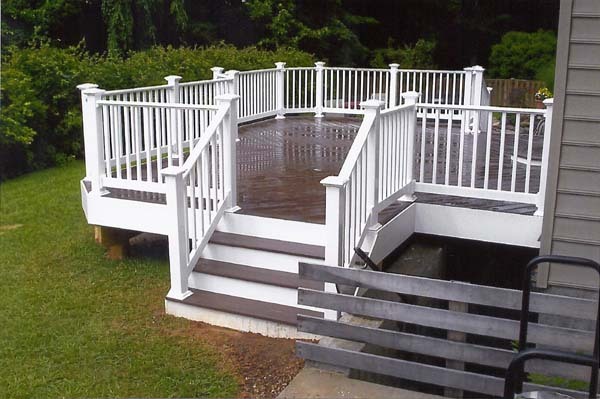 If you’re ready to schedule your deck installation, call Freedom Fence! If you have questions about spring deck installation, or for a free estimate, visit our website or give us a call today at 443-271-6841. This entry was posted on Wednesday, February 10th, 2016	at 4:59 am	. Both comments and pings are currently closed.